Hello Lovelies! Today, is an absolutely lovely day. The weather is wonderful, I just got back from a session at the temple, and I've got some fun plans today... Plus, it's my birthday and my mom and Andrew are making me breakfast. I am one happy mama! 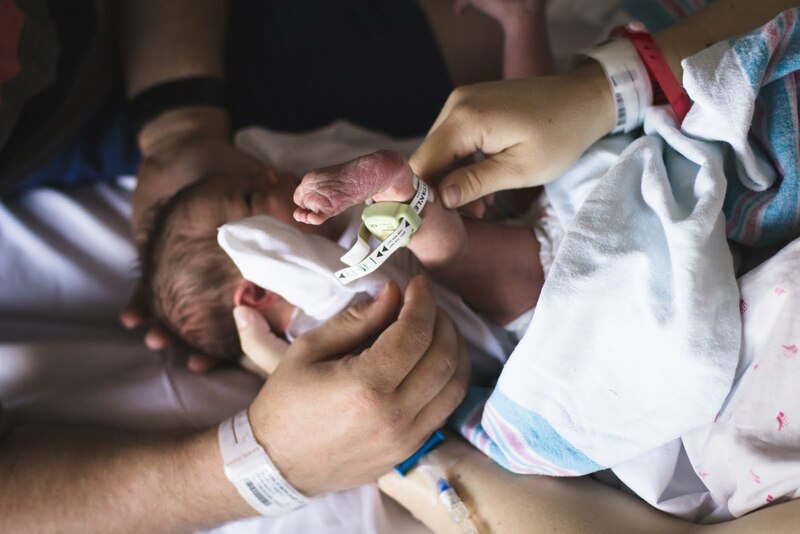 So, I've been pregnant twice now, and one thing I've learned is that sometimes, to get exactly the clothes you want for a decent price, you have to make them yourself. Can you say, "expensive?" So, I learned how to sew them myself! 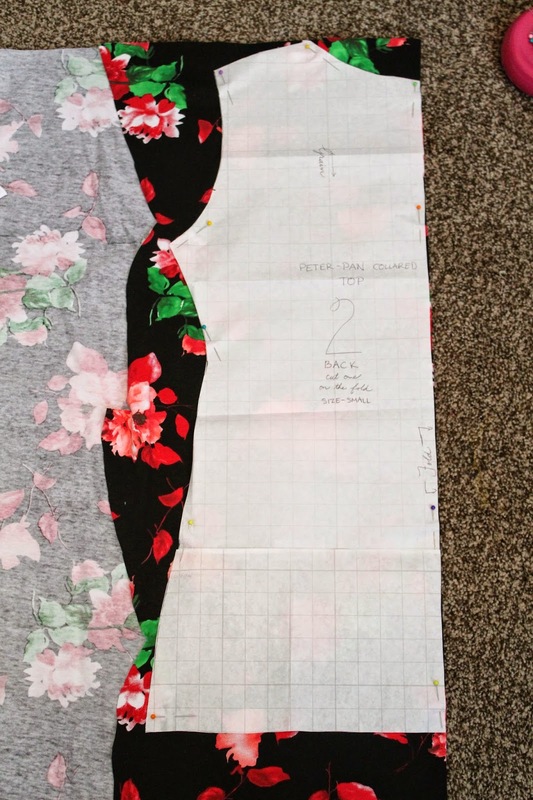 The first few steps require a lot of careful measuring and pattern-creating, but if you do it once, you can save the pattern and use it over and over again! Take your model shirt (a shirt you already own that fits you comfortably around the bust and that you like the fit of the shoulders and sleeves) and fold it in half lengthwise. Align the fold with the straight edge of the pattern paper and trace around the shirt from about three inches below the armpit, keeping a half inch away from the shirt for seam allowance*. Don't forget to draw in the sleeve-shoulder seam as well. 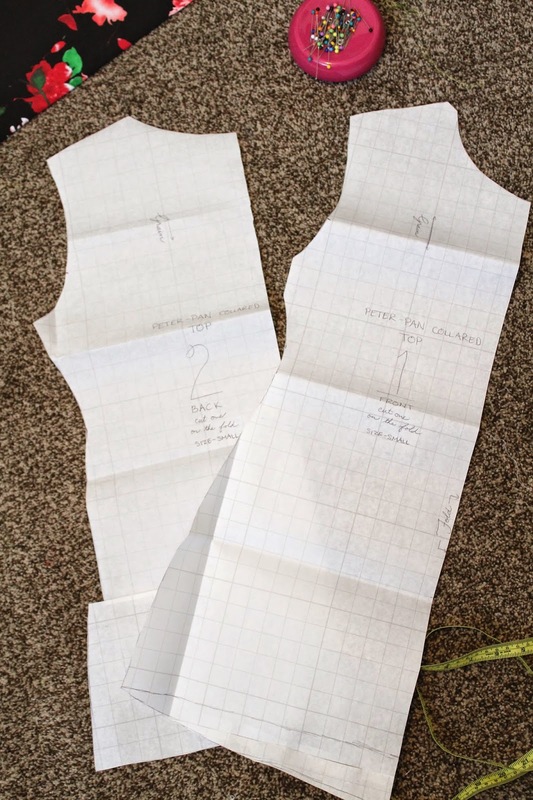 If you want longer or shorter sleeves than your model shirt or a different neckline, now is the time to make those adjustments on your pattern paper. *at the top of the sleeve, trace closely because this will be the fold of the sleeve and you will not need seam allowance. Step 2: Create Pattern cont. Measure from your neckline to your belly button. Make a mark on your pattern paper along the straight edge where your belly button is. Measure around your baby bump and divide by two. Use that measurement to measure out from your belly button mark and add 2". Draw a line from that point to your armpits, and add 6 or more inches to the length to give you full coverage. The side should be 1.5" shorter than the middle. Curve the bottom edge to make the middle and side meet. 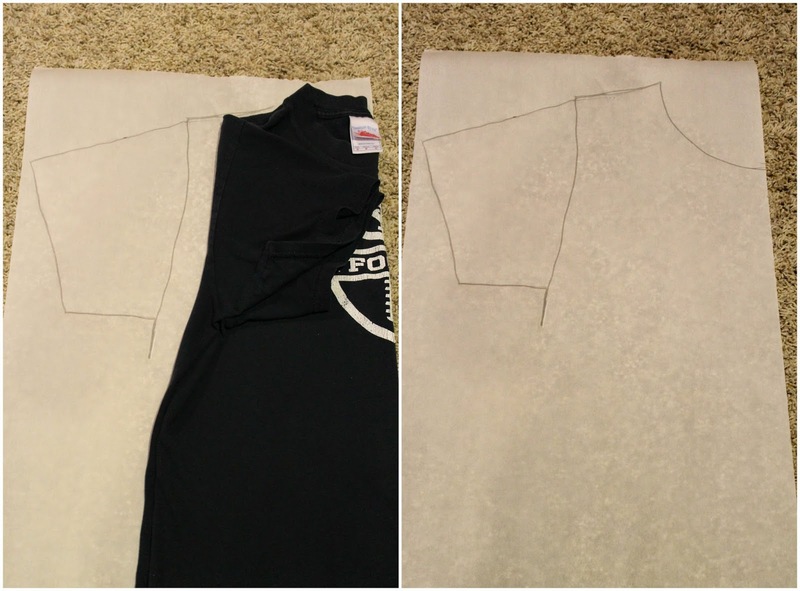 Label your pattern pieces (bodice front and sleeve) and cut them out. 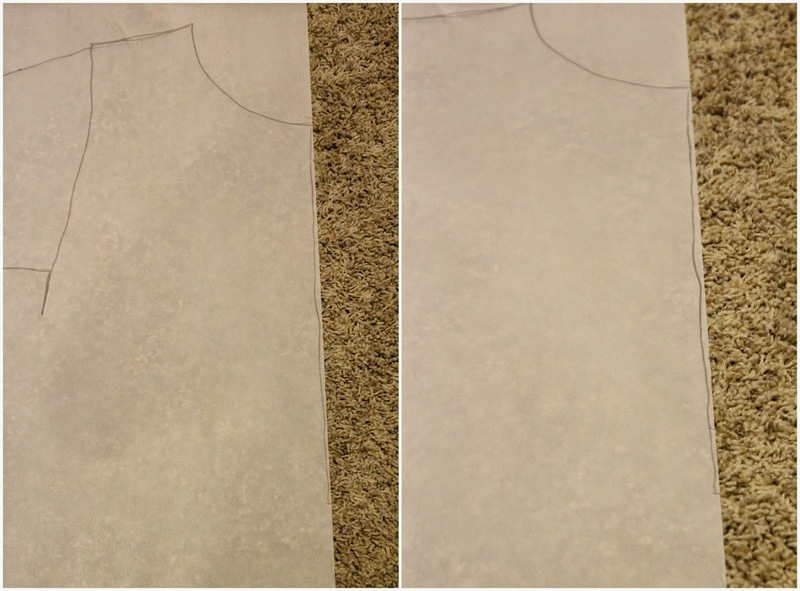 Trace the front bodice piece onto another piece of pattern paper, but raise the neckline. Label (bodice back), and cut out. 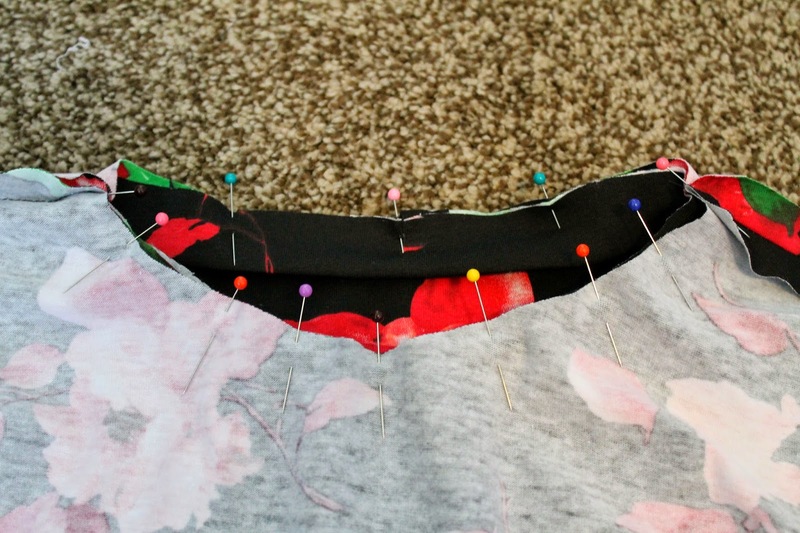 Fold your fabric over itself with the stretch going horizontally, align the straight edge of your front bodice piece with the fold of the fabric, and pin in place. Cut. Do the same for the bodice back piece. For the sleeves, fold the fabric with the stretch going horizontally, and align the top, straight edge of the sleeve with the fold. Cut two. With right sides together, pin the front bodice piece to the back bodice piece at the shoulders. Use a straight stitch to sew them together with a 1/2" seam allowance. Iron seam open. Turn your shirt right side out and lay it down. Take your sleeve pieces and, starting at the top fold of the sleeve, pin it to the shirt piece, right sides together as shown in the photo. 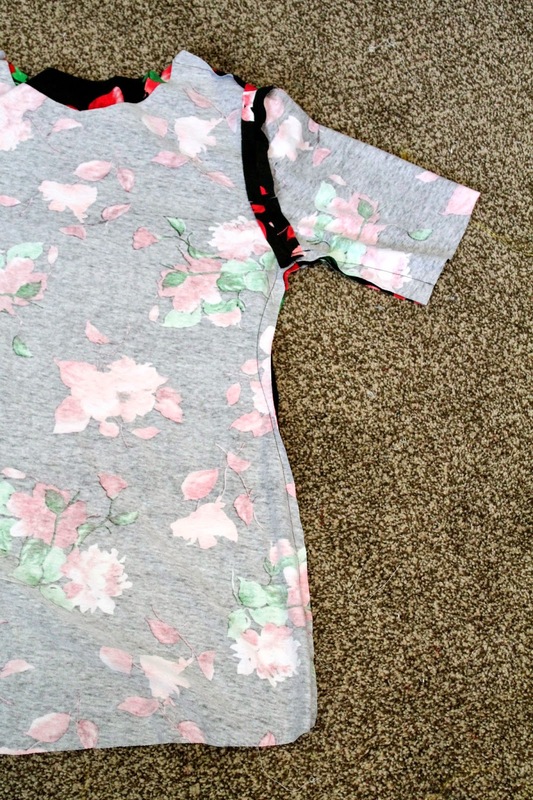 Sew the sleeves to the shirt. 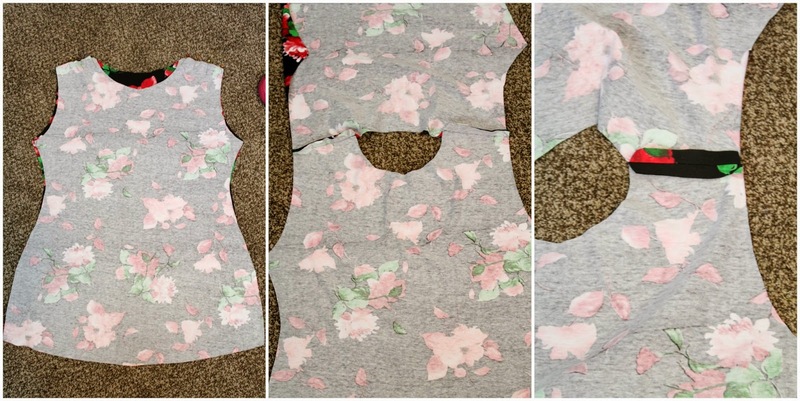 Turn your shirt inside out and pin the underarms and side seams, right sides together. Use a straight stitch to sew them together with a 1/2" seam allowance. Make small clips into the seam allowance (don't accidentally cut the seam!) just above and below the the center of the armpit. Measure around the neckline and subtract four inches. Cut a piece of fabric (with the stretch going horizontally) to that length and 2" wide. Fold in half with right sides together, and sew together as shown in the photo with a 1/4" seam allowance. Iron seam open, turn right side out, fold top of neckline piece in half with right sides out and iron flat, as shown in the photos. Starting from the center of the back of the bodice, pin the seam of the neckline to the shirt, aligning the raw edges. Find the opposite point of the neckline piece and pin that to the center of the front of the bodice. Stretch the neckline piece and pin until it fits evenly around the entire bodice neckline. Sew together with 1/2" seam allowance. This is where the double needle REALLY comes in handy, making a nice, clean, finished look for the hem. 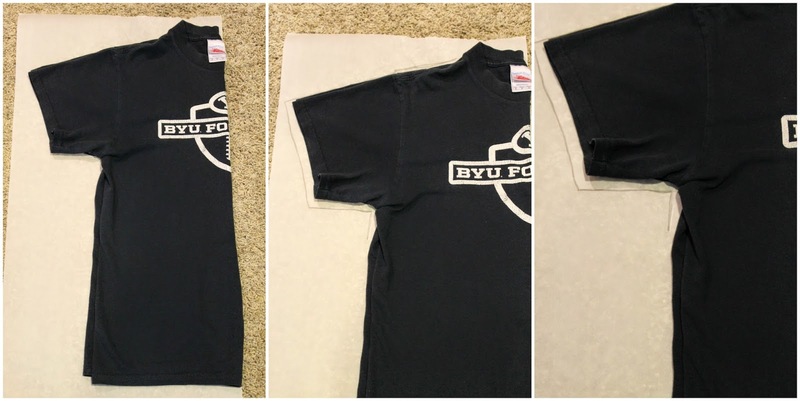 Fold the bottom of the shirt up 1/2" under and sew in place. Repeat for the sleeves. Thanks for stopping by! Good luck, and happy sewing! Thanks Havalah! I totally agree! It's ridiculous how depressed it can make you, too! 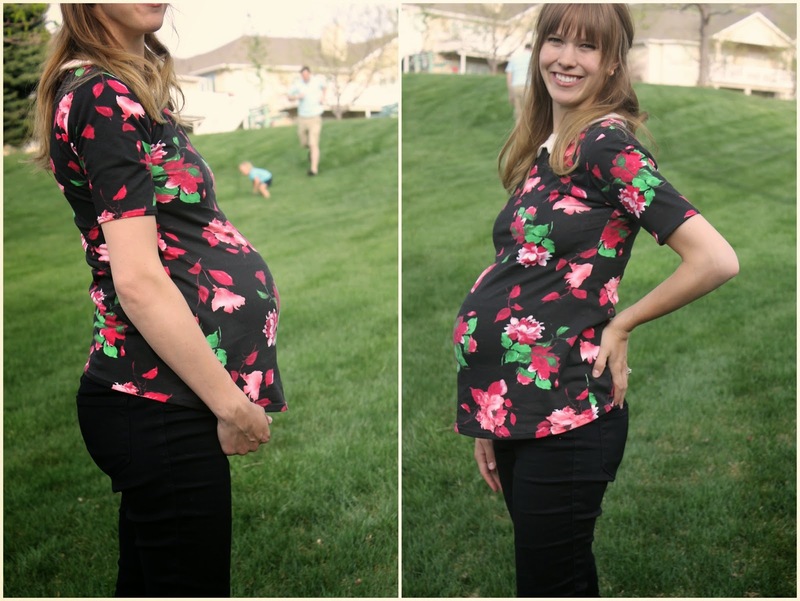 Being able to sew my own maternity clothes has definitely helped my self-image. You are so talented! This is beautiful!